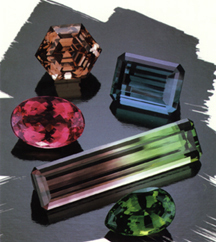 Tourmaline is a complex and exciting group of gemstones offering almost every color of the spectrum. Most gemstones, including diamond, need enhancement through cutting or treatment to be enjoyed in jewelry. Tourmaline may be heated or safely irradiated to permanently produce one of its dazzling hues. While Tourmaline is worn by many active people, it is advisable to remove it before engaging in activities that may cause wear and scratching such as sports, housework and gardening. Avoid home ultrasonic cleaning. While today we are not limited by tradition, the symbolism of Tourmaline is treasured as the birthstone for October along with the gemstone, Opal.